The nano-scale ceramic marble represents a cell. This nano machine is a hundred times thinner than a single human hair. More information about these types of technologies can be found here. What part of the DNA molecule accounts for its “negatively charged” feature? *To receive full credit, you have to answer the bonus question below. This entry was tagged Chapter 10: DNA, Chapter 20: Biotechnology. Bookmark the permalink. The passage states that DNA is naturally negatively charged and and attracts the positive lance this is because of its structure. DNA molecule is composed of a five-carbon sugar, nitrogenous bases, and a phosphate group. The part of the DNA that makes it negatively charged its the phosphate group which contains the net negative charge. I encourage you to do further research on the topic of biotech. Especially on the new handheld DNA sequencers that have been developed recently. The part of the DNA that causes the molecule to have an overall negative charge, is the phosphate group attached to pentose in the sugar-phosphate backbone. Would these technologies make possible a future like the one we saw in GATTACA? If so, should we avoid it? This technologies would make a huge future. For example, if I am going to be a father and I want that my baby would be blond, strong, intelligent, tall; with nanotechnology this is possible. It would be as if having the perfect son/daughter. I avoiding it or not I do not think this will harm anyone but I suggest it is controlled, because anyone could do it for a bad cause. The part of the DNA molecule that is negatively charged is the phosphate group. While the idea of genetic alteration in light of preventing hereditary diseases/disorders seems appealing, there are also many ethical issues involved with such developments. For example, would the genetic alteration of humans result in any deficiencies such as a shortened life span? Is it inhumane to pick and choose which traits you would deem superior to others? Is it really up to us to decide which traits would result in the “perfect” human being? The idea of being able to eliminate hereditary diseases is certainly amazing, but how far can we go before we are breaking the laws of nature? Nanotechnology is a huge step forward in science; there are even nanotechnologies being created that will overcome the bodies resistance to drugs http://www.nanotech-now.com/news.cgi?story_id=51020 . The part of DNA that accounts for its “negatively charged” feature is a phosphate group found in itself. What part pf the phosphate group accounts for this property? It is amazing how scientists are developing new nanotechnologies and creating these incredibly small structures. In fact, nanoinjectors are being made of gold since it is such a ductile material with many properties. DNA is negative because of its backbone containing a phosphate group attached to a sugar. The phosphate group contributes a negative charge to the molecule it is connected to because of its two negative oxygens. A very important emerging field in biotech: nano-materials. These technologies can have actual applications in biomedic research in the next 5 years. The following passage says that DNA is negatively charged and the outside of the lance has a positive charge, they attract each other. The part of the DNA molecule that accounts for the negative charge feature is the phosphate group. The phosphate group contains phosphate ions that are negative oxygens. The part of the DNA molecule that accounts for its “negatively” charged feature is the phosphate group attached to a sugar in the backbone of the molecule; the negativity comes from the negatively charged oxygens in the phosphate group. I’ve read a few things about biotechnology, its incredible how scientists have found a way to put things inside a cell without causing the cell to die. In the article I read scientists use nanotechnology to help in the treatment of cancer by inserting nanoparticles loaded with drugs that help treat cancer into the body of the patient in which they target the tumor. Once near the tumor the nanoparticle dissolves and the content spills the anticancer drug, docetaxel. The reason why the nanoparticle is able to find the tumor is because it is coated with polyethylene glycol, to aid their safe passage through the bloodstream and to shield them from inactivation by the immune system and to de-target them from organs where they may build up and have a toxic effect. Wow. This is a great find, Sebastian. The film ‘Limitless’came to mind–super drugs that can make possible what we call transhumanism, or singularity. I suggest you do research on these concepts. To answer the question I forgot, due to my large interest in the topic is, the reason the DNA is negative is because the phosphate group in the DNA’s sugar-phosphate backbone has a negatively charged oxygen atoms attached to the phosphate. I think nanotechnology will revolutionize everything, particularly the field of medicine. With nanotechnology scientists and doctors will be able to research more efficiently, allowing them to discover new diseases and a way to cure the incurable ones we have nowadays. This is incredible research and technology which could change the world it it. This technology would help improve people’s life by helping identify the DNA sequences that cause different types of illnesses and being able to make medication specific to that DNA sequence. The reason DNA is negatively charged is because of its phosphate group. Just imagine what can be done in the next few decades. 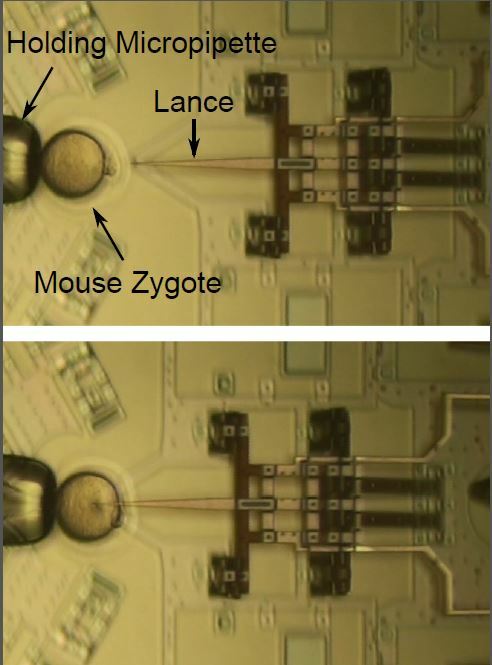 Things can get smaller—robots that can fit inside cells! The possibilities of nanotechnological usage are limitless. I found a website that focuses on nanotechnology in medicine and I’m honestly astounded at the possible future we could have with its help: less deaths, regeneration of lost body parts and nerves, curing for cancer, the list goes on. http://www.nanotechproject.org/inventories/medicine/ Medicine, I think, can be the field were most advances and help nanotechnology can offer. The part of the DNA molecule that makes it overall negative is the negatively-charged oxygens in the phosphate groups attached to the deoxyribose the DNA backbone contain. Nanorobots is the next step. To treat in real time with artificial intelligence—custom made treatment… Let’s hope—and one can only hope—that the promises o biotech do not result in a GATTACA-like future. I find interesting how scientists can insert certain things into the cells without making them die. The passage basically states that the negatively charged DNA is attracted to the positive charge of the outside of the lance. The part of the DNA molecule that makes it negatively charged is the phosphate group attached to a sugar in the backbone. A great breakthrough—to be able to manipulate DNA while leaving the cell intact. The use of nanotechnology in the medical field offers endless possibilities. Techniques that were once only imagined are now at various stages of testing or actually being used today. Nanotechnology can be applied to many areas of study; this alone could revolutionize the way diseases are dectected and treated in the near future. The part of the DNA molecule that accounts for its negatively charged feature is its own phosphate group. Great link. It shows that the government in involved in nano research. Nanoinjectors are a huge advance in genetics. The amazing thing about them is that they could help prevent and cure diseases and conditions, even before the person is born. Although it is incredible how science has evolved, we have to be careful how nanotechnology is used. Nanotechnology is also being used in other fields of work as well. Below is the link for a short documentary on how nanotechnology is being foreseen to be used for war purposes. Like everything, the key for nanotechnology to be success is for it to be used correctly and to not abuse from its power. In regards to the question posted, the negative charge from DNA can be justified by the phosphate group that is part of its structure. The negativity comes from the negatively charged oxygen molecules attached to the phosphate group. To answer the question in this post, the phosphate group attached to the DNA, is what attributes to its negative charge, since the oxygen ions which make up part of the phosphate group are negatively charged. Now, in regards to the topic, nanotechnology and recently developed nanoinjectors, I find it very beneficial to all life, as with a few more years of progressive research, scientists can accurately and safely implant specific genetic codes in human DNA, which can be greatly helpful in surviving specific diseases and/or conditions. Here is an article about rare, but beneficial, genetic mutations in humans, which can help us in the future to fight diseases and become more naturally fit for survival. One of the mutations I found very interesting was the one that mentioned, increased bone density, as it can help us humans become stronger physically and be able to survive deadly accidents and walk away almost unscathed. I hope scientists will keep advancing in the field of nanotechnology and will be able to modify genetic codes to make us healthier and less prone to grave diseases such as malaria or hopefully cancer. Nanotechnology is at the beginnings of a new age of a technological revolution. It has been demonstrated that it will be the technology that will aid in the prevention and isolation of many known diseases from the human body. The idea of nano bots inside our body acting as the white blood cells of our body fighting diseases or even repairing torn ligaments is a stunning concept. From here on out, Nanotechnology will soon be implemented in medicine, construction, computing, among others. It is curious to note how nanotechnology is shrinking the circuits and basic electronic computing features of our everyday devices as evidenced by this article. In regards to AP question as to what accounts for the negatively charged feature in DNA, then the answer lays in the phosphate group of what DNA is composed of. The acid portion of the DNA in the phosphate group is responsible for the negative charge it displaces. This is due to the fact that when this acid portion of DNA is dissolved in water, a proton is released thus ensuring that the electromagnetic charge of DNA is negative. I agree. We are seeing the beginnings of a technological revolution which will determine much of the mayor advancements in the XXIst Century. It is truly astounding the many breakthroughs that science has made in the last years. Nanotechnology and the newly developed nanoinjectors seem to take us one step closer to solving many of science questions relating to medicine research. This could be extremely beneficial to many who suffer from a disease or condition that now seems impossible to cure. In regards to the blog question, the part of the DNA molecule that makes it negatively charged is the phosphate group, as part of the phosphate group contains negative-charged oxygen ions. Nanotechnology is a very interesting and promising field in medicine since it could revolutionize the way we detect and treat damage to the human body and disease in the future, and many techniques. As technology advances fewer limitations will be obstacles to the human race. Here’s a link of the future impact of nanotechnology in medicine and in dentistry. I suggest you do some research on nanorobots and how they can help with customized delivery of medicines. The part of the DNA molecule that accounts for its “negatively charged” feature is its phosphate group. Phosphate groups account for the “negativley charged” feature of the DNA molecule. This technology opens a whole new chance of biotechnology. It will permit to correct genetic mistakes and will possibly help our understanding of cells. It is very important that we are careful with this technology as it can cause as much harm as it can do good. Gene therapy really is a very large advance for the science community. If it reaches its full potential, hereditary diseases could be considerably reduced and humanity would receive great benefits. The negative charge in the DNA accounts to the phosphate group due to the fact that there is negative charge in each oxygen with only one bong coming off of it. «fluorescent diamond nanoparticles» sounds badass—almost poetic. Great contribution, Alanis. The source of DNA’s negative charge is its phosphate backbone which has negatively charged oxygens. Genetic engineering has many implications. The further research into technology like this can save many lives in the right hands, especially in cancer research. Unfortunately, as established in the movie GATTACA, there is also a possibility that it could lead to the practice of eugenics. Eugenics is harmful in the sense that it basically gives people in power the ability to set a standard of what would be socially acceptable; erasing other groups of people. The creation of a perfect race is discrimination. It’s people choosing what genes will be the epitome of beauty and health when in reality different cultures and ethnicities should be celebrated. The DNA molecule has a negative charge due to its phosphate groups. Ethics and science should always be considered together if we don’t want to repeat the atrocities of our ancestors. The subatomic universe is just as interesting and complex as our ever expanding universe. The more research is done in these subjects, the more positive scientific breakthroughs are achieved by scientists for our society. People say that scientists should not tamper with nature, but I differ in their opinion. I think the more scientists “tamper” with nature the closer we are to acquiring a god-like ability; to create life, evolve life, and maybe even control life. Who knows maybe we already are gods by our manipulative ways. Technology is not harmful itself; its the human motivation behind it that decides if it is harmful or beneficial. I think that advancements like the ones discussed in this post or seen in the movie GATTACA can threatened the future of humanity. Although it is very appealing that we may avoid diseases or conditions, I don’t think it is morally correct to practically order how you want your offspring to be like. I think that the use of biotechnology should be very limited, or we will no longer live like humans, but instead as genetically manipulated beings. It will suit a very boring place to live in and there will reach a point where it will destroy us instead of making us progress. DNA is negative because of its backbone containing a phosphate group attached to a sugar, because of its two negative oxygens. The part of the DNA that causes the molecule to have a negative charge feature is its phosphate group. Nanotechnology is one of the many ways we can improve our resources and the way we do research for experiments or diseases, such as cancer. It helps the research immensely providing with valuable data and processes that would be impossible without it. It is the key to the future and we must use it wisely. The part of the DNA that causes the molecule to have a negatively charged feature is the phosphate group, its backbone, attached to the sugar. I think that the same way they can use it for progress and improvement, they can deviate from their main purposes creating more problems amongst the human race. The corrections they make will be fooling natural selection. The more people are savedd from a disease they are supposed to die from the more people there will be in the planet creating over population. the negative part of the DNA that causes it to be negatively charged is the phosphate group attached to a 5 carbon sugar. Biotechnology, nanotechnology, nanorobotics, nanoinjectors, and gene therapy are all terms that go hand in hand in one same field of study and promise to revolutionize the scientific and common world in the XXIst century. Mastering the ability of creating technology that can be so small but yet effective opens a whole new world of possibilities that could not be possibly reached before because of the size limitations. Professor Martel, a researcher in the field of nanomedicine and the first one to guide a magnetic sphere through a living artery, announced a major new breakthrough. His team at the Nanorobotics Laboratory at Polytechnique Montréal was able to successfully guide microcarriers loaded with a dose of anti-cancer drug through the bloodstream of a living rabbit, right up to a targeted area in the liver, where the drug was successfully administered. They were able to do so by controlling magnetic nanoparticles with an MRI system and guiding the microcarriers through the blood vessels. This development acts as a precedent to the theoretical nanotechnology engineering techniques of nanorobotics and gene therapy. This discovery is a step forward in medicine and nanotechnology, that seemingly will develop a symbiotic relationship in this century. The negativity of DNA comes from the negatively charged oxygens in the phosphate group, which is attached to a sugar in the backbone of the molecule. The passage expresses that the lance is charged with positive charge in order for it to be attracted by the DNA’s negative charge. The DNA is negatively charged because its phosphate group is made of negative oxygen ions. The video explains that positive charge is put on the lance so that DNA collects outside of it. The lance would then be inserted into a cell and the charge would be reversed so that the DNA is dropped in. This is the process of the new gene therapy strategy using a nanoinjector device that can be used to prevent/treat many diseases. It is amazing what scientists have been developing through time. Discoveries and inventions as this one are the ones that will cure diseases and make life’s natural struggles more duable. People nowadays need to have more interest in technological advances as this instead of other things of minor importance. Researches like this one need to be funded so more incredible discoveries and advances can be made, Answering the question, the DNA is negative because of the two negative oxygens in the sugar attached to the phosphate group in its backbone. Nanoinjection has become a prominent method due to its incredibly small lance and minimum requirement of extra fluid, which enables cells to undergo less stress. The part of the DNA that accounts for its negative charge is a phosphate group which is attached to the sugar backbone; the phosphate has negatively charged oxygen atoms. Nano technology is slowly becoming more and more common place today further pushing us into a grey zone how do we define humanity when nanotechnologies are permanently in our bodies changing and modifying our genes to make us healthier or healing a traumatic injury. this will be the technology that marks humanities next evolutionary step half organic and half technology who knows maybe one day itll even be hereditary. I expect more and more advancements like the one seen above during the next few decades in the field of nanotechnology. Just imagine the things we can do with it and gene therapy. It is critical to the medical research of many common deseases like diabetes, cancer, and Alzheimer’s. The part of the DNA molecule that accounts for its negatively charge is the Phosphate group. This is truly amazing. 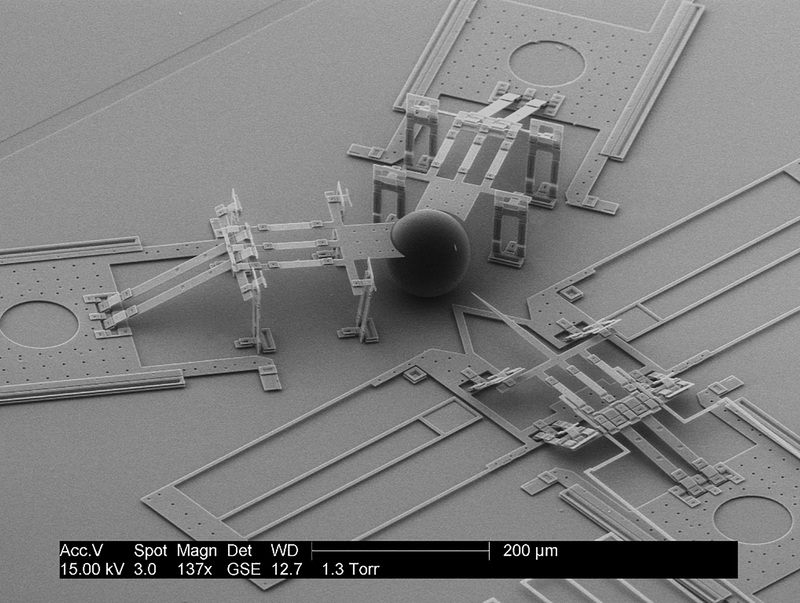 Scientist can create with nanotechnology small structures. This is becoming one of the most important fields in science because it can help other fields improve and most important do better for science. If carbon was the material used for the lance, then scientists would use carbon as a conductor to send a positive charge, attracting the negatively charged oxygens in the phosphate group of nucleotides. It’s interesting to read about the advances in nanotechnology and how advanced technology has gotten in general. It’s also very fascinating to watch how the lance entered the cell and delivered the DNA. I would like to witness how nanotechnology improves in the future and how we might be able to use this technology to cure cancer in the future and other serious diseases. Also, we might be able to use it to make enhancements to the human body. For example, we could repair human tissue and improve intelligence, thus making us live longer. It is simply amazing to see what has been achieved through trial and error and applied knowledge. As stated above, these researchers were able to use the net negative charge of DNA to their advantage by fabricating a tiny, solid needle and applying a positive charge to it, which would result in the attraction of DNA molecules to said needle. Thus, injecting DNA into a cell would not result in excess fluid entering the cell, and cell rupture would be highly unlikely. Now, why did this post catch my attention? The answer is that this type of research is exactly what will allow us to progress on scientific research. As a medical research doctor, I want to further advance studies on many illnesses that currently affect us, especially the ones that have to do with genetic disorders since these are the most tedious and challenging. One cannot simply eradicate a disease that affects a whole person’s genome! … Right? Well, for now, I feel that the possibility of entirely removing such diseases from human genetics is not too high, for the most effective method that would achieve this would be artificial selection, something highly related to eugenics and therefore scientifically immoral. But if we cannot eradicate the disease, we can control it. This is why medicines were developed, why they keep developing. However, medicines today still carry a major disadvantage: side effects. These medical mishaps can be as harmless as runny noses or as fatal as internal hemorrhages. Kinda beats the whole purpose of treatment, huh? Perhaps the candidates that did not suit the general study groups could have ended up suiting some individuals specifically. For this reason, I plan to focus my studies on the genetics behind diseases such as cancer, heart disease, diabetes, and other major illnesses that lead the charts on global deaths. I will work together with scientists and utilize methods such as the one shown in this post in order to be able to further research on the possibility of medicines that will target patients’ genomes specifically. The benefits that would follow this would be infinite, but among the most celebrated might just lie the elimination of cumbersome side effects that often only decrease the patient’s health. As to how this will be achieved, only time will tell. Perhaps we will witness the arrival of this scientific miracle or perhaps we will be some of the many promotors for the research. Nevertheless, I promote all who are interested in medicine and public health to brainstorm on ideas, be it to further current ideas or create entirely new solutions to scientific challenges around the world.